I have been seeing two symptoms. First of all sometimes the alternator cuts out. The ammeter shows a discharge and the the volts drop to battery voltage. This usually happens when the car is cold. Second the amp light will occasionally just come on. This never seems to correspond to the alternator cutting out. So I figured the alternator is having issues but I figured there was no harm in waiting to see what would happen. Turns out I was wrong. Yesterday I needed to run some errands close to home so I jumped in the Jeep. As “normal” the alternator did not kick in right away. Then as I was driving I noticed the voltage had shot up to 16 volts. That is way, way too high. Crap. Then I noticed the gauges on the dash were dead. Double crap. The voltage stayed high the whole way home. So today I did some troubleshooting. The book spells out step-by-step what to do. 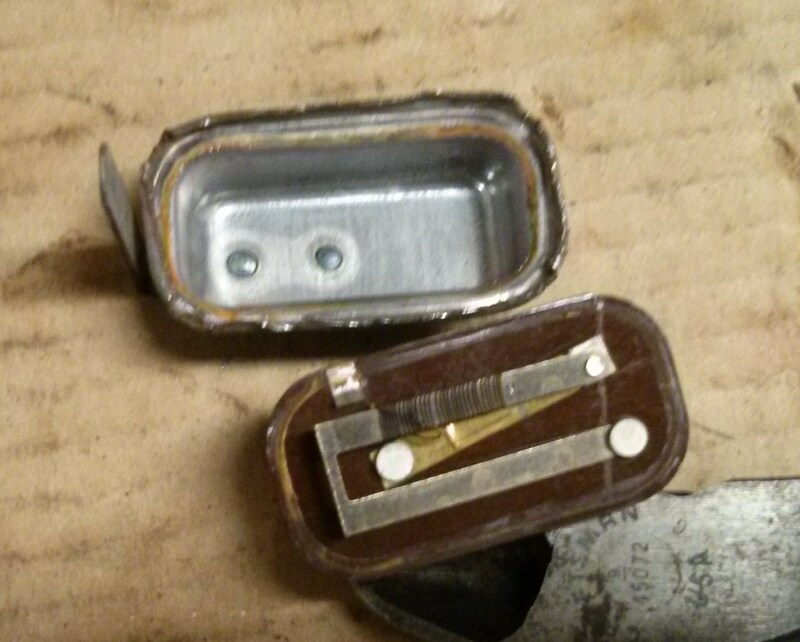 So the first check is the isolation diodes. They checked out OK. So next check is the output. I started the car and again the alternator was not charging. 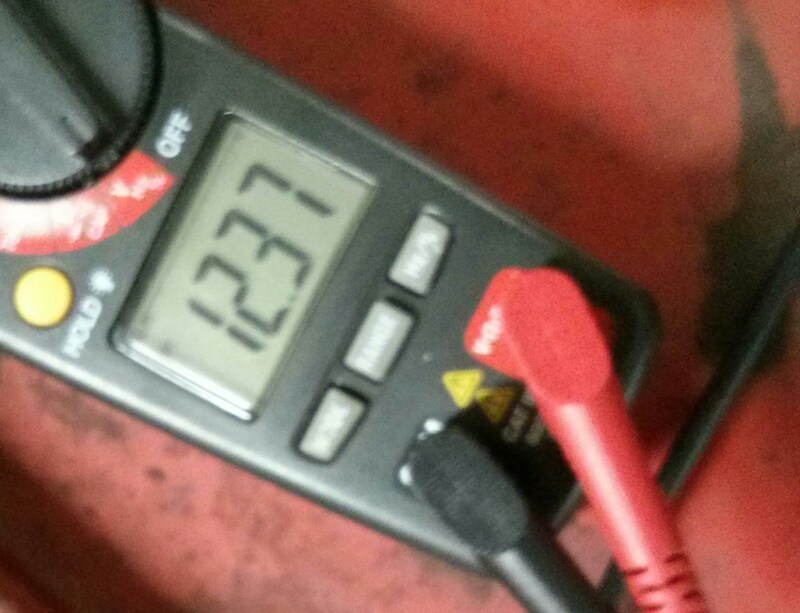 I verified the voltage was just battery voltage. So is it the alternator or the regulator? Per the manual I disconnected the field connection and the voltage regulator. 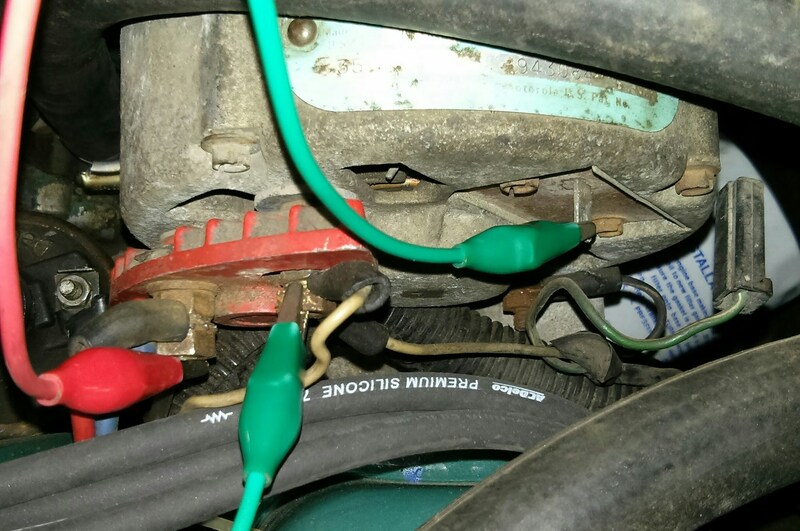 Then I used that green jumper to connect the field terminal to the aux terminal and started the car again. Per the manual I should be seeing 15 or so volts on the aux terminal. Instead I saw 70! That can’t be good. Obviously the alternator is not working right. 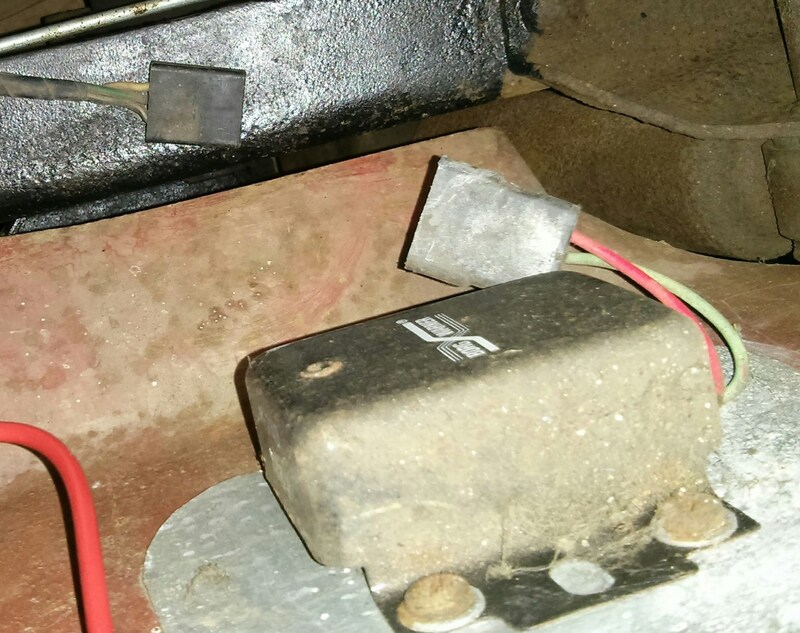 The Jeepster’s alternator is a Motorola unit with an external regulator shown above. I did some internet research and it looks like most people just replace them with Delco 1-wire units when they go bad. You can still get rebuilt alternators and regulators but the GM system is cheaper, simpler, and probably more reliable. So I will probably do that. Just to be sure I decided to remove the alternator and take it in to get tested. Of course I forgot to charge my phone so I don’t have pictures of the circus that followed. 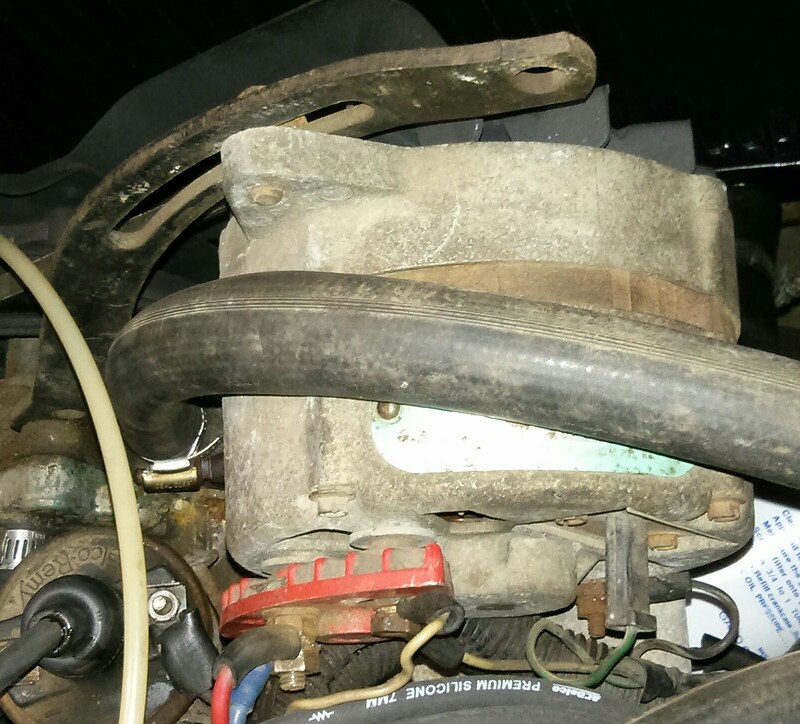 Usually it is dirt simple to remove the alternator. Disconnect the wires, take out two bolts, done. Then I found out the lower mounting bolt is too long to get out now that the radiator core is 1/2″ thicker than it was. So I had to remove the whole alternator mount from the engine block. It was only three more bolts but it was still more hassle than I anticipated. Anyway once I got the beast out I took it to my FLAPS (friendly local auto parts store) and got it tested. Sure enough it is not working. I think I am going to put the Delco alternator in there. I will go alternator shopping tomorrow. For now time to see why the gauges went dead. 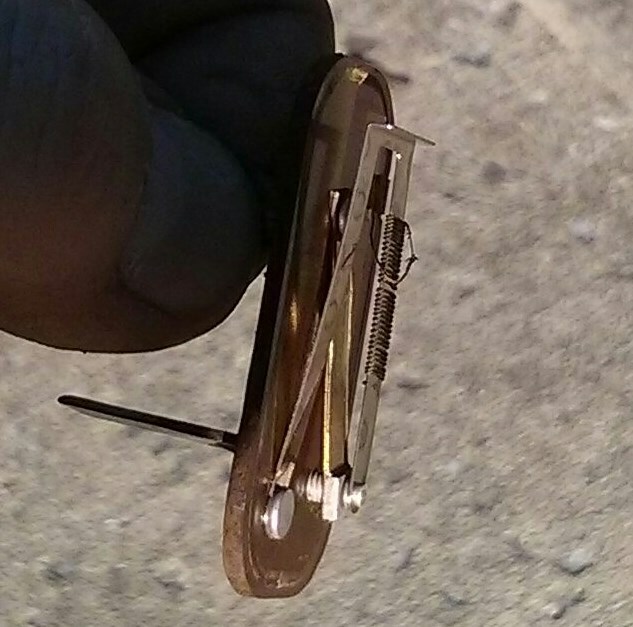 Per the service manual this guy is the most likely reason for both gauges and both idiot lights to stop working. It is a voltage regulator that plugs into the back of the instrument panel. It’s job is to provide a constant 12V to the gauges so they don’t move every time you turn the headlights off or the turn signals blink. I checked it’s ground first. That is just fine. 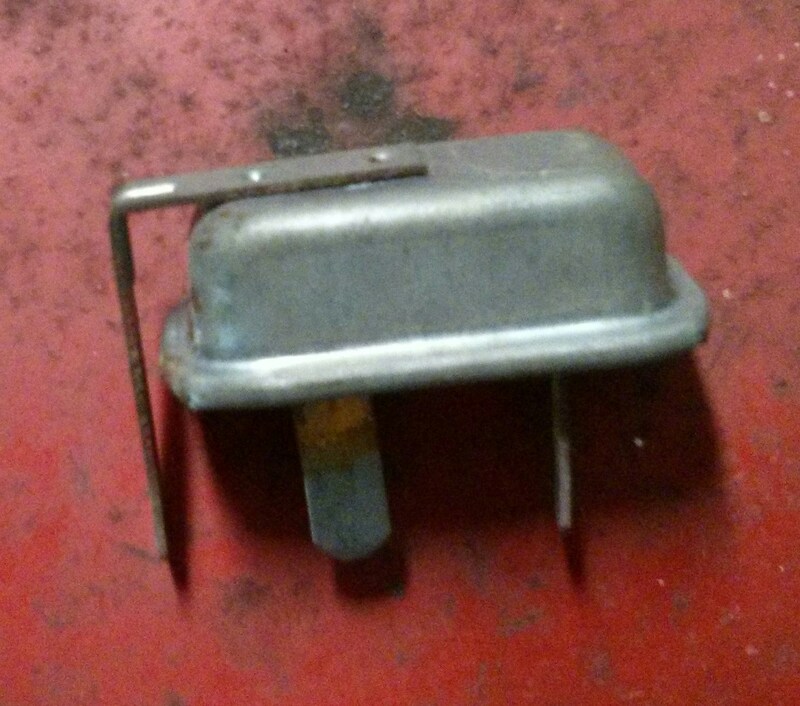 So most likely the high voltage coming off the alternator fried this regulator. I found this replacement online and ordered one. Now I just have to wait. Just for grins I decided to pry the old one apart and see how it works. Well that is some low-tech stuff going on here. What we have here is a bi-metallic spring wrapped with a heater wire. System voltage comes in and heats the wire. The spring heats up and flexes, breaking the contact. Then the spring cools off and the contacts close again. Very old school. There is no continuity through the resistance wire and this looks like a break. Like I guessed I must have fried this thing with the voltage spike off the alternator. Nothing to do now until I round up some parts.